The ebullient manager of Moo Grill greeted us with hugs and kisses as we walked through the door. We were clearly long lost friends, though we’d never met. 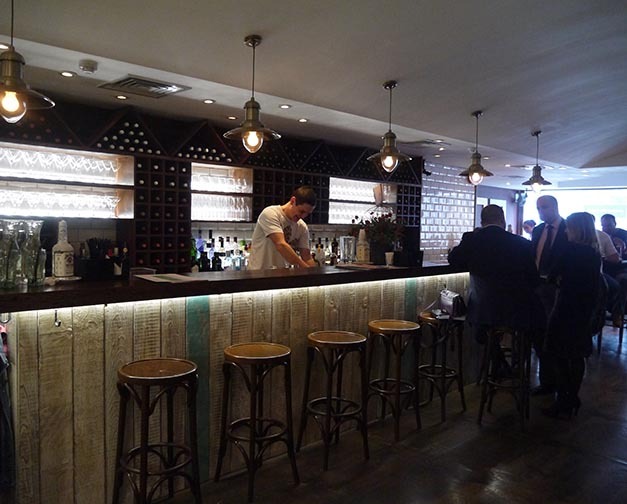 Decision time – to eat in London steak house – or allow ourselves to be transported to Argentina for lunch? It was cold and grey in London and the choice was obvious. Putting a ‘sensible’ hat on for a moment I did try to order some food to go with the cocktails…in fact my intention was to sample the Empanadas at this stage. But a large place of pan and chimi and a pot of olives in chimichurri sauce arrived first. And who am I to decline when things are offered so graciously! I rather liked the lightly oil drizzed and herbed slices of bread piled high with chimi – a lot tastier than bar snacks of crisps and nuts. We sampled the Gin cocktails. 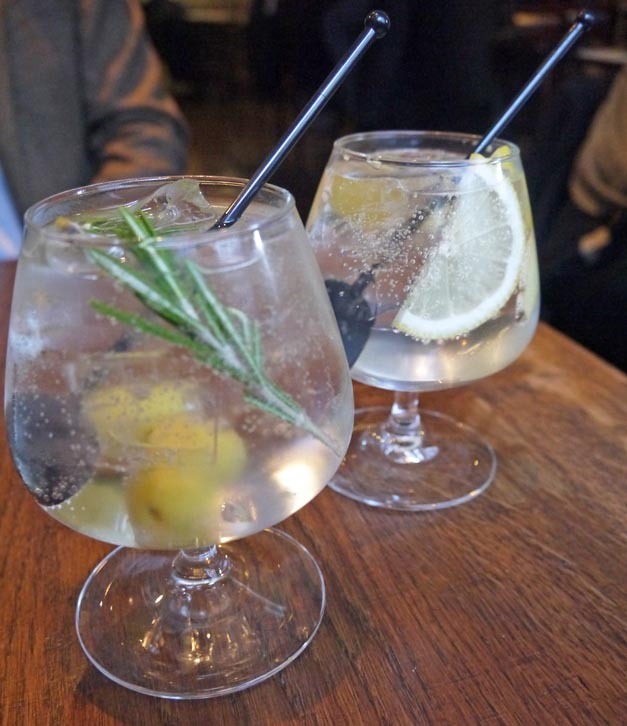 Mine, a Citadelle Gin paired with a little thyme and rosemary was light and refreshing. My friend enjoyed Brockmans gin with ginger. Moo Grill has a range of nine different gin cocktails, each with different herbs and spices to reflect and compliment the aromatics of the base gin. 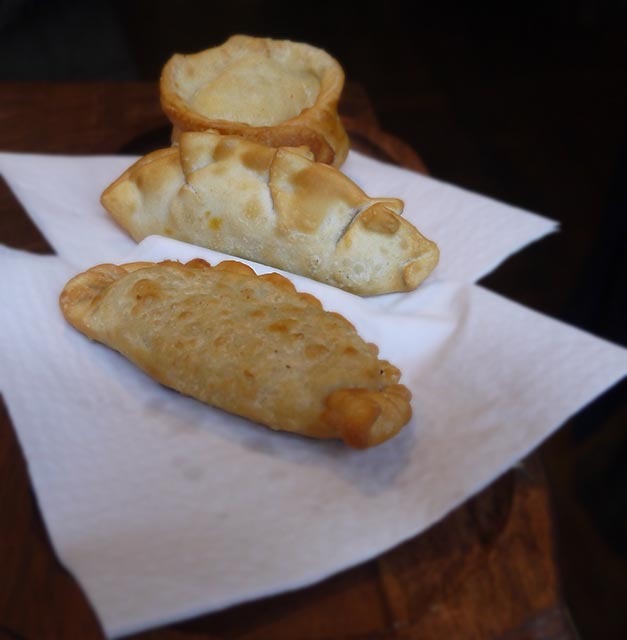 Of course the empanadas were good. And of course if you go you should try all three. 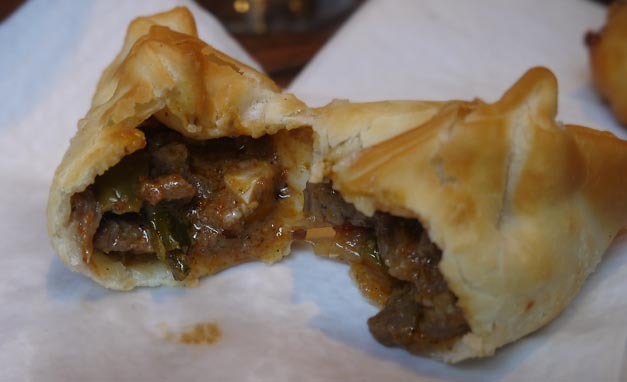 The Carne is a classic filled with chopped beef eggs and olives and wrapped in a flaky pastry case. These are apparently from an old family recipe. 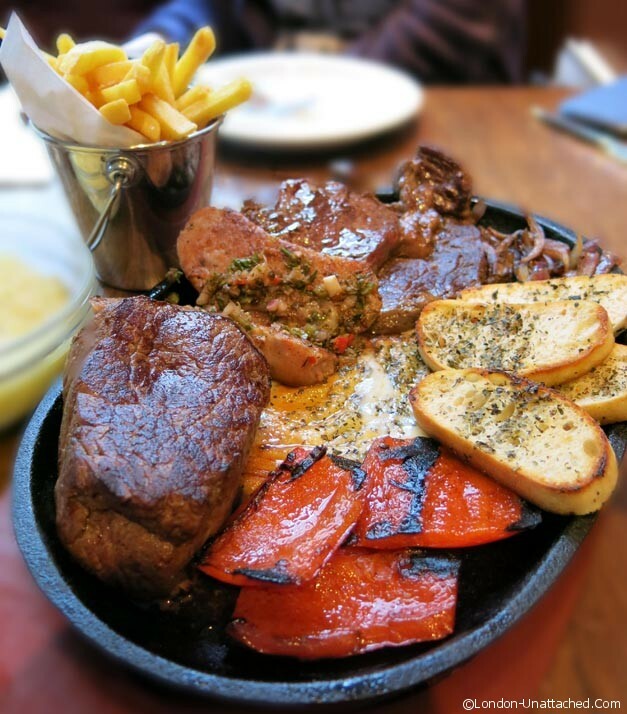 The main meal was a platter of some of the different meats on offer at Moo Grill together with some provoleta, fries, grilled red peppers and more chimichurri. Oh and a plate of mashed potato (as if either of us needed any more to eat). 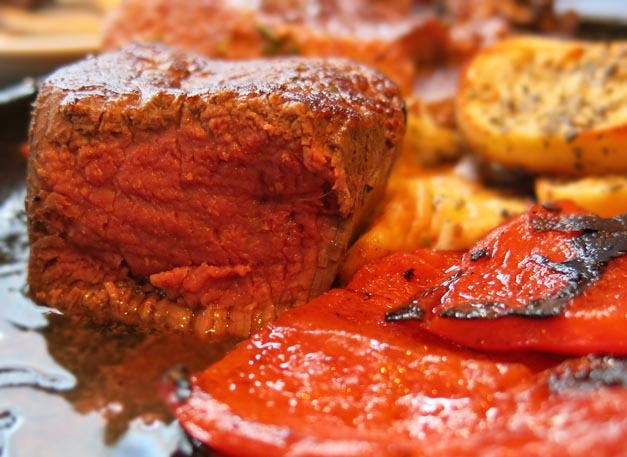 I did particularly enjoy the medallon de lomo, a fillet steak you could have cut with a fork. 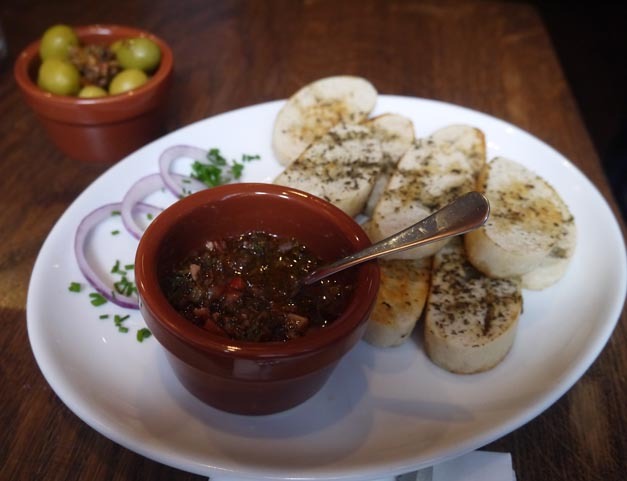 I also loved the Chorizo – nowhere near as dense and paprika spiced as its Spanish cousin, but with more flavour and texture than your average British banger, this is Moo’s own recipe sausage. And they really do know how to grill steak too; our fillet was beautifully rare, while the entrecote was cooked a little longer and served medium well done, with a nice charred exterior. 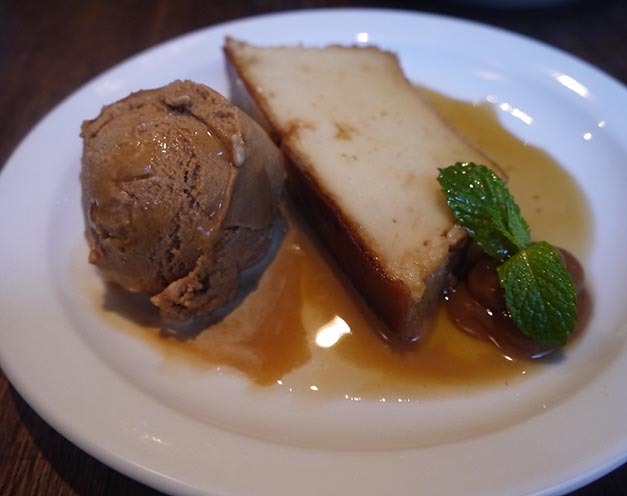 Desserts of Flan and Ice cream and Budin de pan disappeared in a trice, washed down with some rather good dessert wine called Malomado – an Argentinian Malbec. Now, we got into conversation throughout this meal with the table next door, two lawyers having lunch who were regulars at Moo Grill. I got the impression that for them part of the joy of the place was a complete escape from being ‘in the City’ without having to walk more than a few yards from the office. And, by the end of the meal, we felt if we’d gone somewhere to eat where we too were regular customers. Friendly, exuberant and high spirited, it is, so we were told, an Argentinian grill with its heart in Cordoba rather than Buenos Aires. 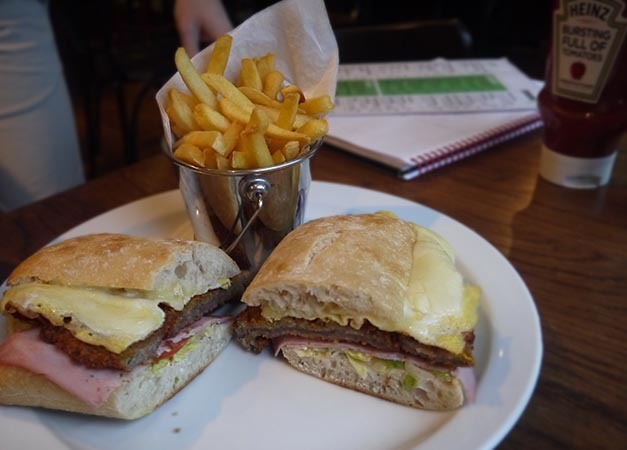 Less formal, more of a party atmosphere and with a range of food that includes some fine looking lomitos if you don’t want to eat a full meal. We were sitting under one of the speakers and at one point the owner asked if the music was too loud. You know, of course it was a bit loud. But rightly so – to have turned it down would have been to miss the point of this vibrant eating and meeting place. Oh, there are so many good looking food items there. 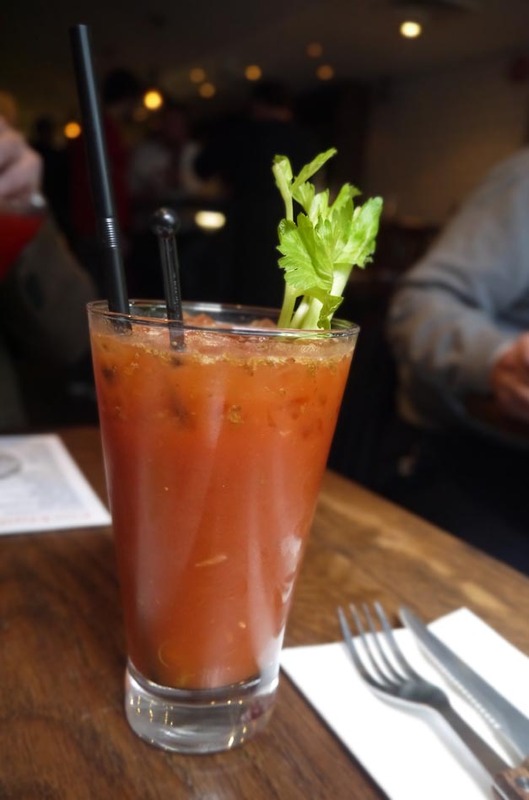 Sounds like FABULOUS hospitality, so important in adding to the overall experience of dining out. And agree, your cocktails sound spot on! looks so great!! I love this! lol stevie! you commented as I posted!!! the main thing about this place was the COCKTAILS!